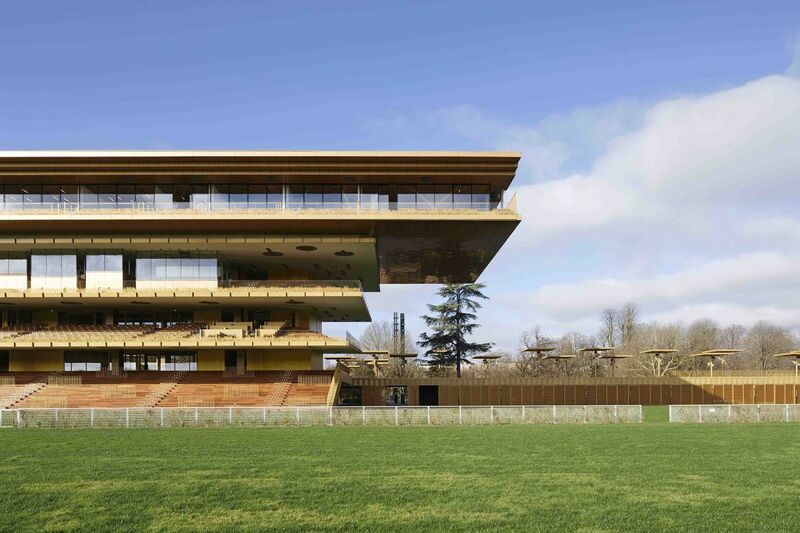 "The renewal of the Longchamp racecourse should ensure that it maintains its place in both the Grand Paris and on the international scene of the world’s major racecourses. Such an ambitious goal must be guided not only by an emblematic architectural project that can be adapted to future needs, but also a landscape project that transfigures the area, highlighting the built legacy, the historical heritage of the racecourse, and especially the green heritage of the Bois de Boulogne, which originated in the composition designed by Alphand in the 19th century. The race for the Prix de l’Arc de Triomphe is the highpoint of the life of the racecourse. Therefore, the main challenge of this project is for it to be able to host this event, which draws up to 60,000 spectators, under exceptional conditions, while also welcoming a much smaller crowd on ordinary racing days. This is why the project proposes to deconstruct all the stands dating from the 1960s and to replace them with only one stand, which is both more compact and more functional. Buildings housing support services for the horse races, which are currently scattered around the site, will also be demolished and rebuilt in the form of pavilions. Finally, the historic buildings of the racecourse will be renovated. The architecture of the stand is in motion, like a galloping horse. 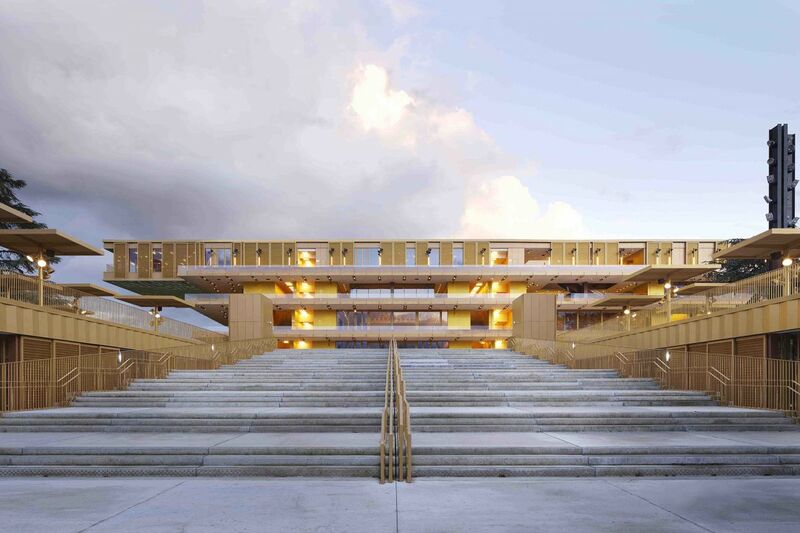 A slight overhang orients the interplay of superimposed stands toward the finish line. 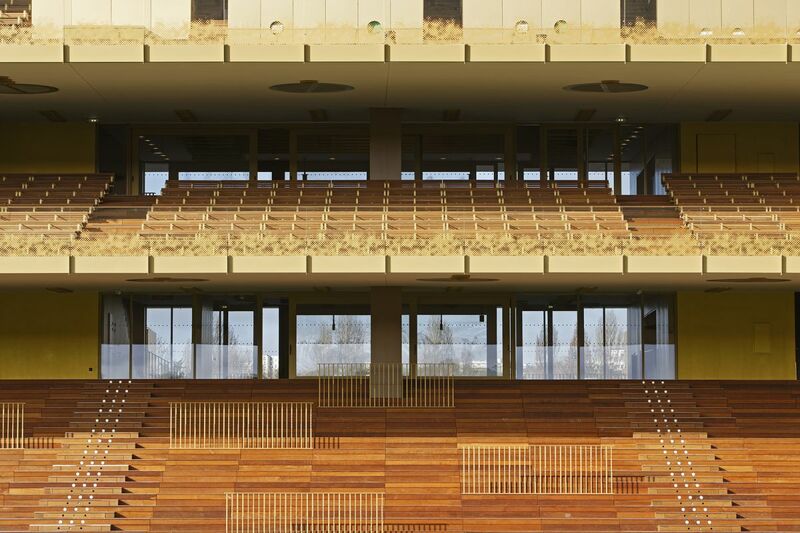 But this gap on the racecourse side creates stands that overlook the course, while on the side of the parade ring, a balcony stand is formed. In fact, all the features―terraces, walkways, transparencies, and open staircases―will provide permanent views of the entire racecourse with, of course, privileged views over the parade ring and over the course itself. 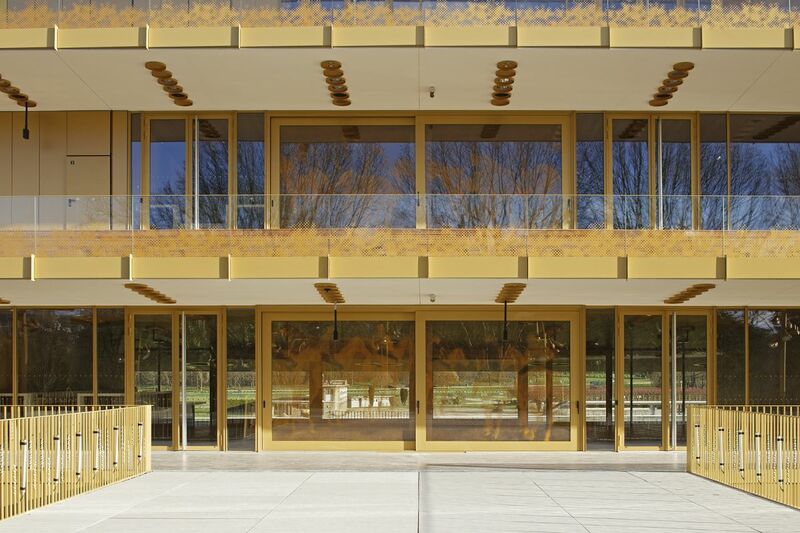 The architectural concept is one of transparent “shelves”, with neither front nor back, enabling spectators to go back and forth from a view over the stables to a view over the racecourse. In short, the architectural project creates generous perspectives over the landscape thanks to the significant reduction of the size of the existing constructions on the site. 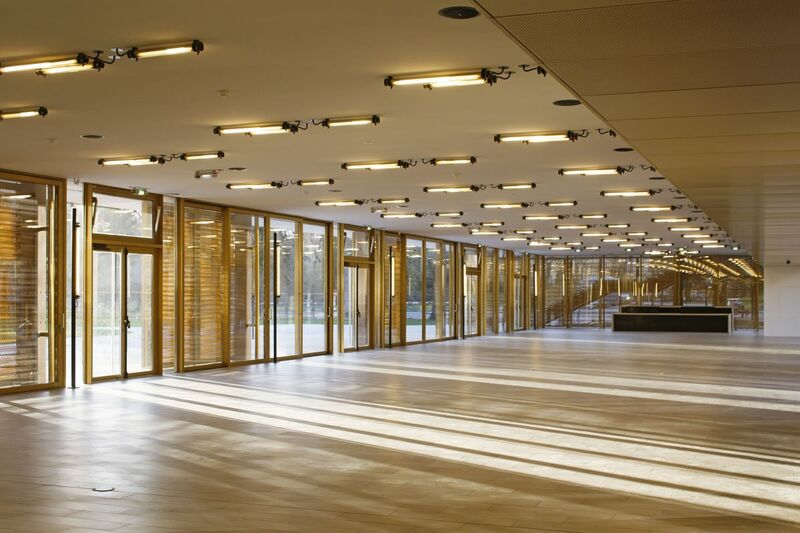 The architectural design is very pared down, simple and elegant, allowing the gaze and light to pass through the buildings. The public is always in visual contact and proximity to the horses and professionals, without ever coming into direct contact. 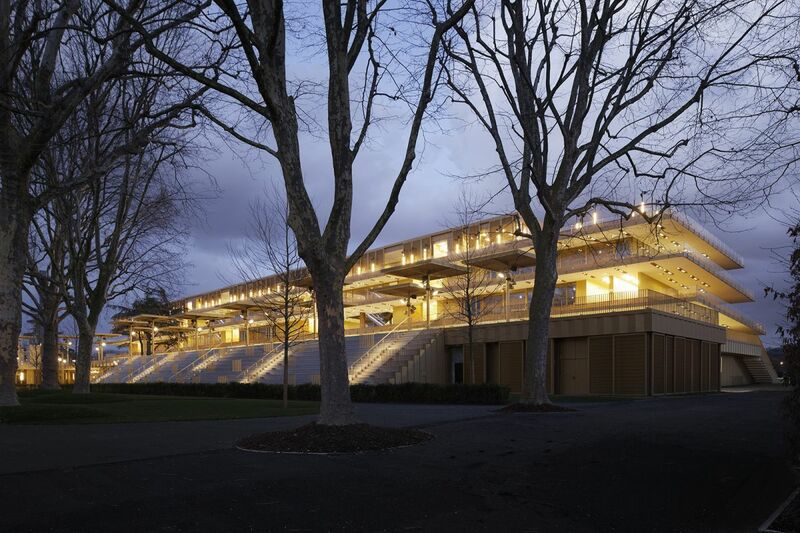 One could describe it as fluid architecture that guides movement, as symbolized by the overhang of the grandstand, which also allows the landscape to pass through it. Hidden in nature, The New Longchamp revives the charm of garden parties of the past, of promenades in the wood and the poetry of the Bagatelle gardens, while also offering comfort for all types of public and an effective and efficient facility for all the betters. 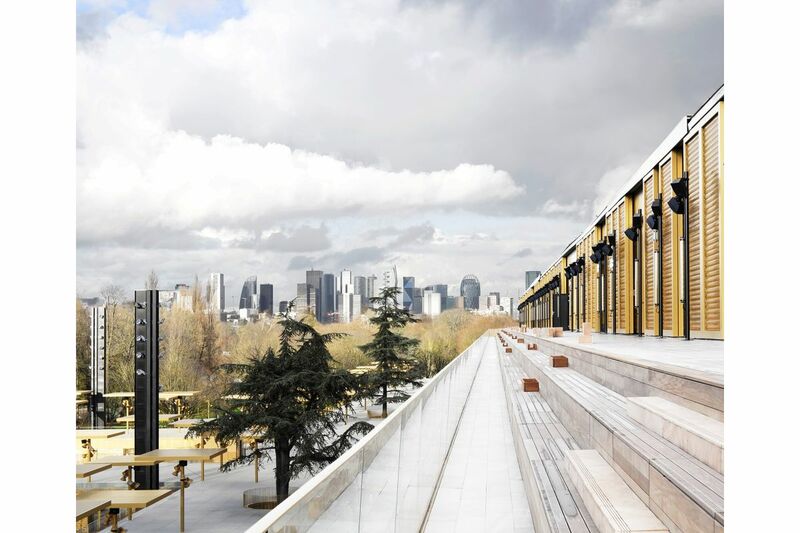 The project for the New Longchamp will be a model environmental facility of its kind and thus meet the objectives of the climate plan developed by the city of Paris. 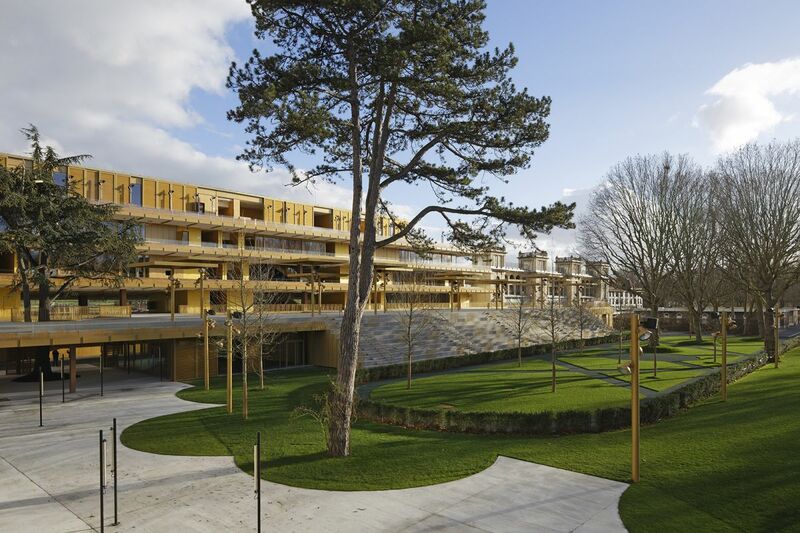 In conclusion, the intervention consists of creating a more naturel place encouraging future planting; more ecological, thanks to an innovative design and the integration of both passive and active systems encouraging the use of renewable energy and the energy independence of its buildings; more flexible, by creating a wide variety of places enabling Longchamp to welcome greater numbers under conditions adapted to the diversity of racecourses; and finally, more pleasant, for the comfort of all users of the site, the horses, jockeys, horsemen and women, professionals and the public at large." - (2) Existing stables: it includes a relaxation circle, surrounded by 98 boxes dedicated to horses and a box for showers, a farrier, etc. - (3) Totalizer: it was built at the end of the 20’s and it housed the first calculators necessary for the rating of the numbers assigned to each horse. The refurbishment will cover offices on the first floor and rooms for lads on the upper floors. - (4) Pavilion Tribune (conditional phase): this historical tribune designed by Charles Adda in 1921 is refurbished in order to renew with its original aspect (especially the reopening of the gallery on the 2nd floor on the tiers with the needed structural reinforcement). It includes a 780-sqm room on the ground floor and 1,500 seats in two tiers. - (5) New Jockey-Club Tribune: the demolishment of the existing tribunes will make room for a unique tribune integrating the presidential tribune; the reception halls are located on the historical axis of the entrance (with the Pavillon d’Honneur). 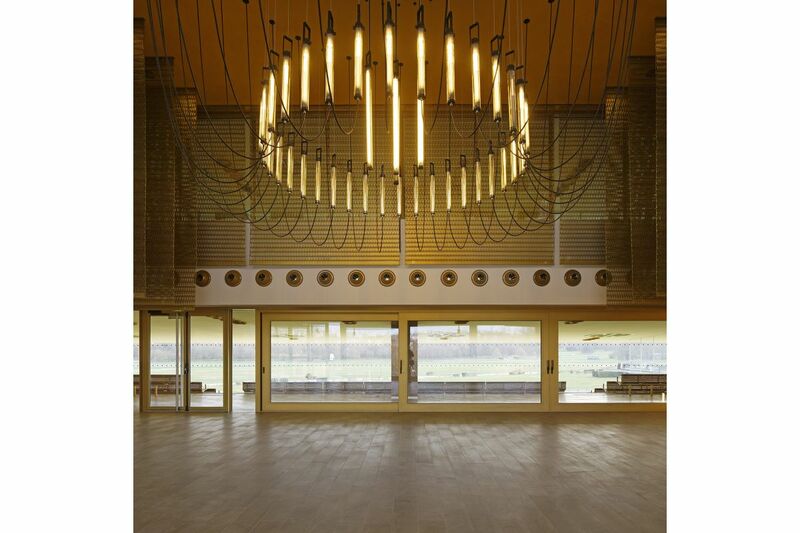 The Jockey-Club Tribune offers 10,000 tiered seats; it includes also 1 restaurant with its terrace on the 4th floor, 5 reception halls, 5 bars, 1 brasserie, press rooms, rooms for monitoring the races (especially for the photo finish) and areas for the staff (including a restaurant). - (14) Totem P2 (conditional phase): located at the “pelouse de Suresnes” (Paddock of Suresnes), it includes some race areas linked to the P2 finish post. The paddock of Suresnes hosts the ephemeral tribune during the main events. Landscape: The total size of the project is 92,000sqm, for which 22,000sqm will be built and 70,000sqm will turn into green areas. They were designed as a whole. The landscaping restores the coherence of the original edges, by reviving a visual porosity at the west border. Besides, it enhances the existing green heritage.